On 5th July 2018, the NHS will be 70 years old. We are going to be celebrating with a party; there will be singing, dancing, and games: pass the PFI parcel, pin the fail on the crony, and pick the cherries of the birthday cake. We invite you to help us celebrate in the most creative and subversive way we can and reinstate our NHS. Lead by Simon Stevens, NHS England has overseen billions of pounds of NHS funds going to for-profit companies. NHS England’s ‘Five Year Forward View’ promises to hand billions more of taxpayer’s money to commercial operators. Private firms operating in the NHS will often use the NHS logo so patients have no understanding who their services are being provided by, all the while taxpayer’s money is being funneled into offshore accounts, such as Richard Branson’s Virgin Care who pay no corporation tax in the UK because its parent company is registered in the British Virgin Islands. Trump intends to make the NHS pay more for prescription drugs as part of his ‘Put American Patient’s First’ scheme. Lower drug prices was one of Trump’s main campaign promises, and he intends to put pressure on ‘freelaoding’ countries with ‘socialised’ medical systems to pay more through trade negotiations and agreements. The US has one of the most unequal, bureaucratic and expensive health services in the world, but Teresa May has refused to exclude NHS services in a US trade deal. We are sending a strong message to the US government and our own, that our NHS is not for sale. Jeremy Hunt has overseen the introduction of Accountable Care Organisations which enhances the role of private companies and allows them to decide who gets care, how funding is distributed and what services are provided, while shareholders and bankers cream off profits through closures and downgrading. Despite publicly defending the NHS, the Government has cut billions of funding and has introduced contracts to many private companies. These include many US healthcare companies such as Optum (United Health), The Practice (Centene), HCA NHS Ventures (Hospital Corporation of America) and Aspen Healthcare (Tenet Healthcare). 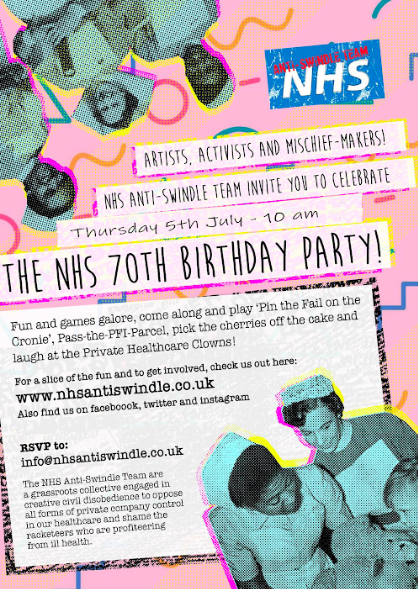 The NHS Anti-Swindle Team are celebrating the NHS Birthday by demanding that we abolish the internal market within the NHS. Protect the NHS for everyone who relies on it services, and give the future generations the security of a comprehensive, universal healthcare system for everyone. We support the NHS Reinstatement Bill that promises to make the NHS publicly owned and provided, accountable and efficient. Next Post 29.09.18 – ACT UP London Autumn Mischief Making Gathering – Book your place here!